Due to budget cuts in education, there are are a record number of teacher retirements this year. Therefore there are a record number of teacher retirement parties. After 19 years, one of the best Special Ed teachers in Texas is retiring to spend more time with her family and traveling...good for her! 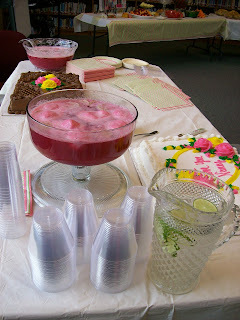 I was in charge of the punch. Here is my recipe for a delicious cran-raspberry-lime punch. It can be doubled, tripled or quadrupled to meet your crowd requirements. Look on my Recipes Page for this awesome recipe!